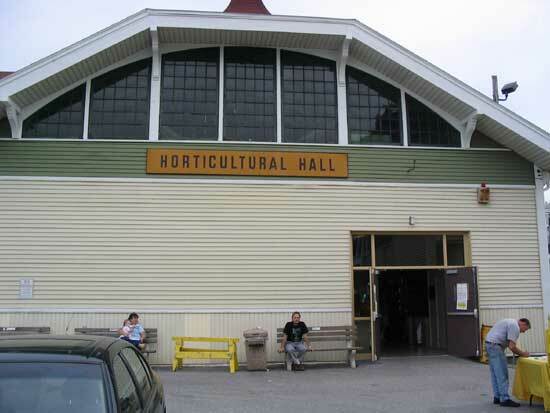 This is the eighth annual White Rose Gameroom Show and it's the second year in the Horticultural Hall at the York Fairgrounds. The show is organised by Eric Selak and Marlin Barshinger, two of the original four who started the event back in 1997. 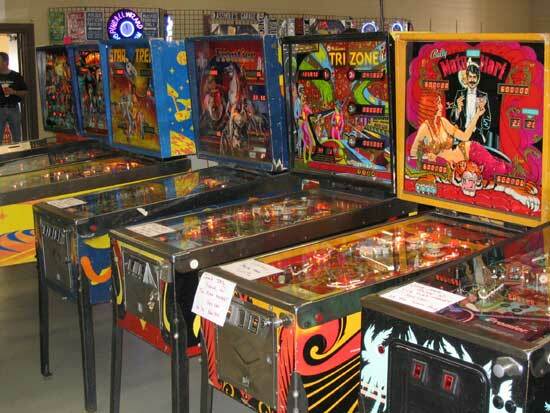 For this year's show they brought together 125 pinball games, a couple of dozen video games, several parts vendors and lots of visitors paying their $12 and determined to have a good time. WhoDunnit?, Black Rose, Last Action Hero, No Good Gofers, Mary Shelly's Frankenstein, Hook, Whitewater, World Cup Soccer, Striker Xtreme, Rollergames, Jurassic Park, Lost in Space, Dirty Harry, Goldeneye, Terminator 2, Breakshot, BayWatch, Bride of Pinbot, Teenage Mutant Ninja Turtles, Space Jam, Whirlwind, Theatre of Magic, High Roller Casino, Game Show, Batman Forever, Medieval Madness, Star Wars Episode 1, Can Can (bingo), Silver Sails (bingo), Fish Tales, Show Boat, Sky Line, Dr. Who, Bride of Pinbot, Flash, Outer Space, Kings of Steel, Incredible Hulk, Barbwire, Operation Thunder, Gold Strike, Ice Revue, Super Soccer, Mata Hari, Royal Flush, Jive Time, Mata Hari, Street Fighter 2, Fathom, Post Time, Sky Jump, Vector, Funhouse, Bride of Pinbot, F14 Tomcat, Tales from the Crypt, The Getaway, Fish Tales, Bram Stoker's Dracula, Judge Dredd, Demolition Man, World Cup Soccer, The Shadow, Big Hit, Cue-T, Odds & Evens, Diamond Jack, Genie, Bride of Pinbot, Big Hurt, Attack from Mars, Scared Stiff, Champion Pub, Creature from the Black Lagoon, Soccer, Supersonic, Banzai Run, Duotron, Big Guns, Raven, Hollywood Heat, Mata Hari, Tri-Zone, Frontier, Star Trek (Bally), Alien Poker, Magic, Lucky Ace, Mr & Mrs Pac Man, Daffie, Party Zone, Bank Shot, Butterfly, Dealers Choice, Black Jack, Aces High, Wild Cargo (flipperless), Target Pool, 4 Aces, Triple Action, 300, Street Fighter 2, Special Force, Gold Ball, Grand Slam, Pinball Pool, Cyclone, High Hand, Super Mario Brothers, WhoDunnit?, Pool Sharks, The Getaway, Bram Stoker's Dracula, Rocky & Bullwinkle, Shaq Attaq, Johnny Mnemonic, NBA Fastbreak, Roadshow, Grand Slam, Star Trek-TNG, Fish Tales, Sharkey's Shootout, Hurricane, Terminator 2 and Viper Night Drivin'. All the games were set to free play and were mostly in a good or fair condition. Some had not been restored at all while some were pristine and a credit to their owners. 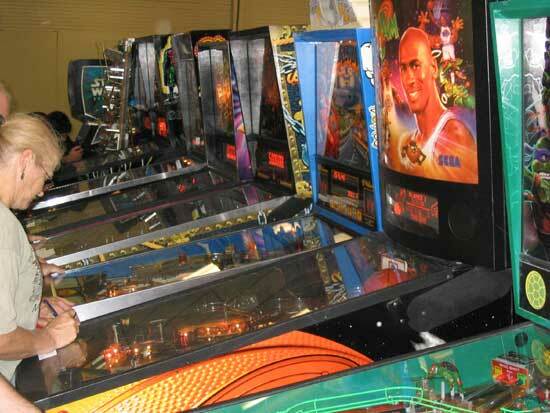 The former were presumably there to be sold and many games had for sale notices attached to the playfield glass. There has been some discussion recently about whether seller should be charged to bring their games to a show if they are sold. 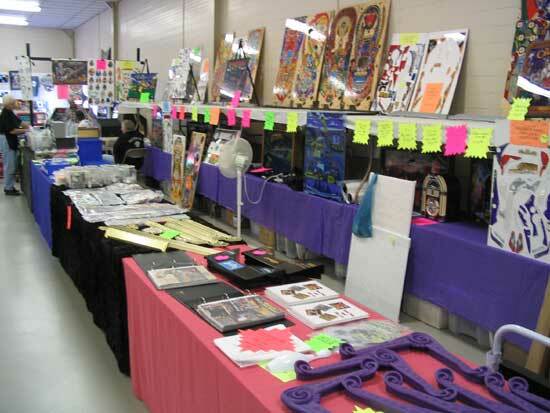 Eric and Marlin have taken the simple approach of not charging sellers and giving them free entrance to the show as well. In return, there is a 4pm deadline before which no games can be removed and all games must remain switched on for general play before that time. There were several tournaments held over the two days. Friday saw kids and mechanical contests while on Saturday there were doubles, ladies and electronic competitions. In addition, several small door prizes were given for ticket holders with winning numbers and there was a give away of a Blackout pinball machine as a grand draw prize. But it wasn't all game playing. 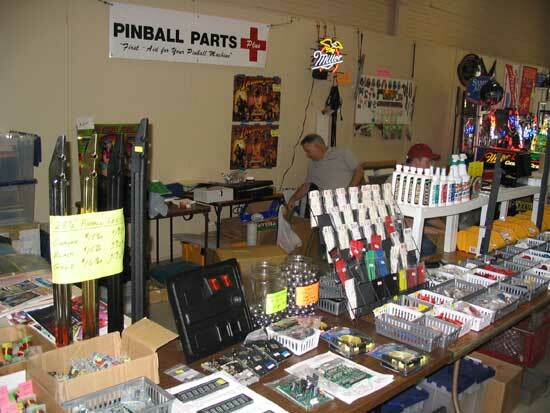 There were also several parts vendors such as Mayfair and Pinball Parts Plus selling common parts and Illinois Pin Ball were there selling their NOS and re-manufactured parts. 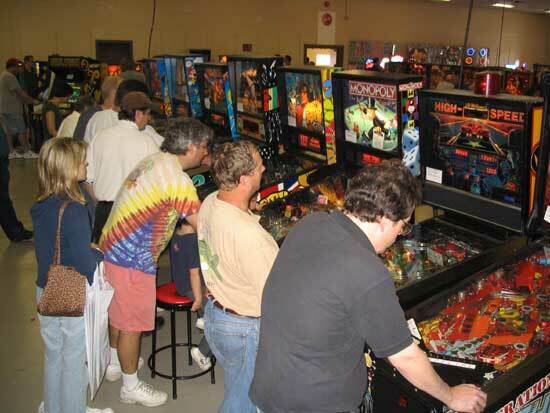 Owner Gene Cunningham spoke to Pinball News about one of his projects for the future and you can read all about that in our News section report. 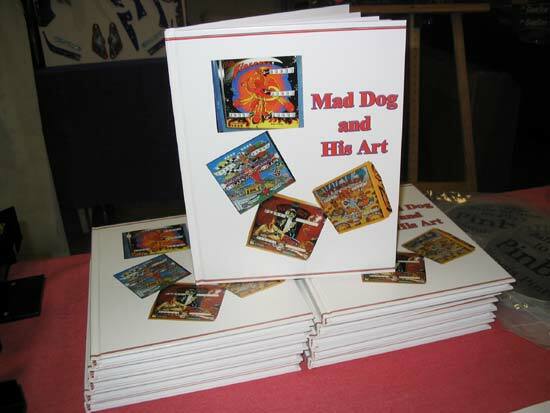 He also had his new book about pinball artist Dave Christensen. 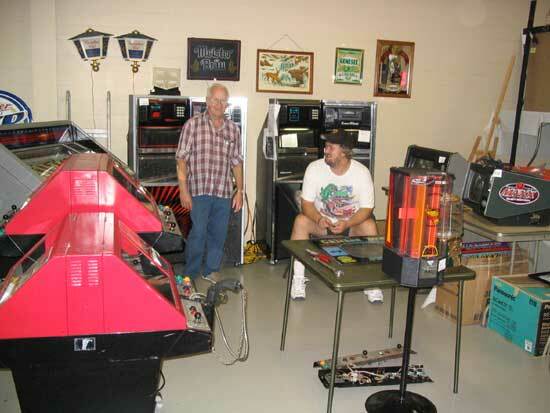 There were also sellers of jukeboxes, video games, bar merchandise and other goodies to finish off your game room. Despite the number of games and vendors, the White Rose Gameroom Show retains the friendly feel of a much smaller event. The games are well spaced and there usually a vacant game to play somewhere in the hall. Improvements can be made by raising the overall quality of the games and improving the signposting for the show - we drove around the York fairgrounds for several minutes before we found the hall and didn't see any directions. It would also be good if lighting glare could be reduced. But those are minor criticisms of a great show which is a must for anyone living in the region.